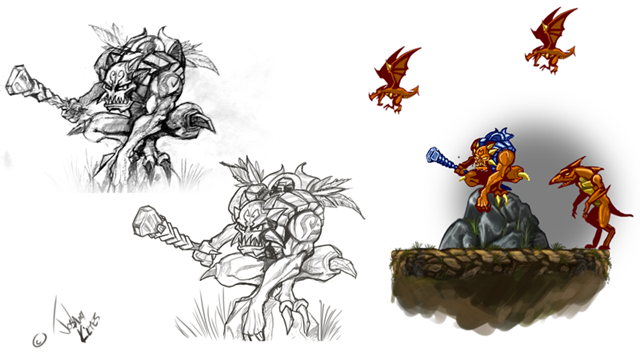 In August, we programmed most of the new Rokknor (Dwarf) abilities and bot units that we concepted in July; we spent some time studying some of our favorite retro games, which inspired new art assets that we’re very pleased with; and we extended some of the existing player mechanics. Throw in a bunch of updates to our engine, some visual FX, our first special enemy encounter (warrior), and new music from goat to top it off. We spent July concepting, developing units, adding player interactions, and updating the engine. I’ve started compiling all of my sketches and the current game status into a simple html that is becoming our status board along with utilizing Asana to track idea evolution, status’, and to-do lists.